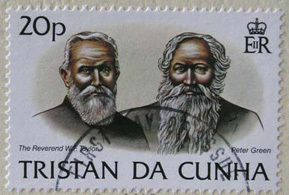 Tristan da Cunha's first permanent settlers came with the British Garrison of 1816/17. More came as mariners or were shipwrecked, and wives were sent for from St Helena. A small group, led by Scot Corporal William Glass ( with his South African wife Maria and two children) and accompanied by Devonian stonemasons Samuel Burnell and John Nankivel, persuaded the commanding officer of the British Garrison to remain on Tristan. They began a most remarkable project which they called 'the firm', underpinned by a signed voluntary agreement of communal living including : equal shares of stock and stores; equally divided profit; equal shares in paying for purchases; no one superior over another. This agreement was signed on 7th November 1817. 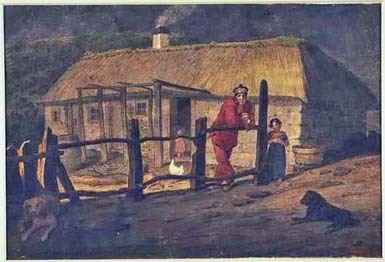 The picture, left of William Glass outside his thatched home, was painted by artist Augustus Earle who was marooned on Tristan in 1824 and is reproduced with permission of the National Library of Australia. The tiny community grew slowly, and many only stayed for a short time. Exceptions were Englishmen Richard Riley (from East London) who was shipwrecked on the sealer Emily in 1820 and Alexander Cotton (from Hull), arriving in 1820 aboard HMS Satellite who both settled permanently. 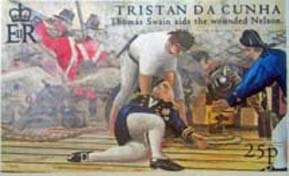 In 1821 Tristan hosted 50 survivors of the East Indiaman 'Blenden Hall' who were rescued from Inaccessible (see Inaccessible Page ). This influx more than trebled the population and led to food shortages during the 1820/21 summer. Early attempts to trade directly in seal oil and skins failed as the Tristan-owned schooner Jane was wrecked in Table Bay and when co-founder Burnell absconded with the profit on another Cape Town trip. The world's first and most successful Blind Date? In 1826 sailor Thomas Swain, from Hastings in Sussex arrived (with many stories including one that he had aided the wounded Nelson see left) and brought up the number of bachelors to five. Only William Glass had a wife and family, so Simon Amm, captain of the Duke of Gloucester, a regular visitor to Tristan, was commissioned (allegedly for a sack of potatoes per woman) to try to persuade suitable partners from the island of St Helena to try their luck with the lonely men. Amazingly Amm returned in 1827with five volunteers, and it is reported that Thomas Swain,( who had vowed to take the first woman to step ashore), duly took Sarah Jacobs for his wife. By 1832 Tristan had a population of 34 with 6 couples and 22 children! The 1840s and 50s saw more ships, with up to 70 whalers being seen from the Settlement on one occasion. Pieter Groen (who became known as Peter Green on arrival) from Katwijk in Holland was shipwrecked on the ship Emily in 1836 and, with American whalers Thomas Rogers (1836) and Captain Andrew Hagan (1849) married island girls and brought new blood into the growing community. Rev W Taylor (pictured left with Peter Green) was the first resident priest and schoolteacher.